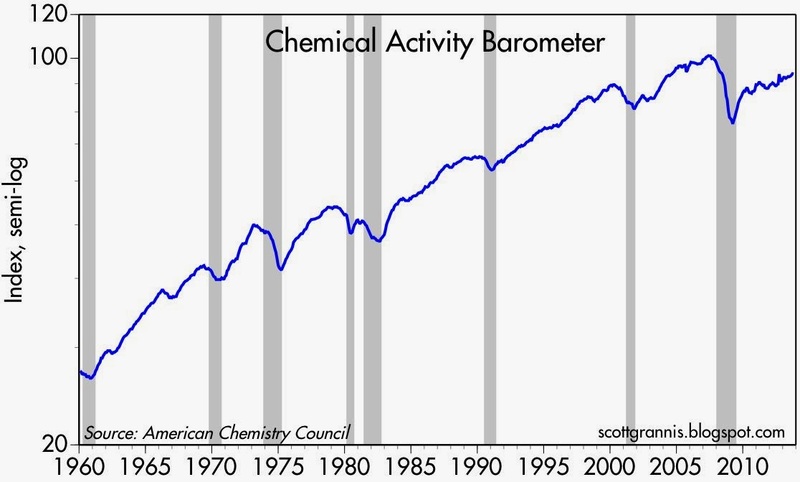 This chart is the perfect comeback to those who argue that the stock market is once again in bubble territory. 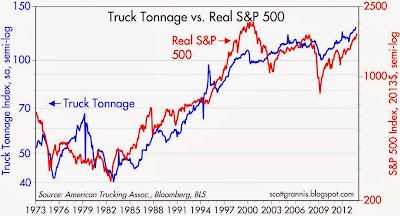 What it shows is that the real value of the stock market is positively correlated, over time, with the amount of freight hauled by the nation's trucks. In other words, the physical size of the economy has a lot to do with the real, inflation-adjusted value of the economy. Truck tonnage in September hit another all-time high, up 8.4% in the past year, and up almost 30% since the economy began to recover in mid-2009. The physical economy is apparently growing much faster than the official GDP statistics suggest (real GDP growth has been about 2% per year during the current recovery). This is comforting, to say the least. 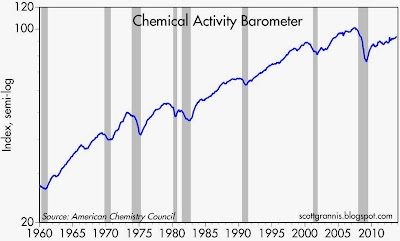 And as the chart shows, since the real value of the stock market hit its all-time high in early 2000, the economy has improved dramatically, while stocks are still struggling to regain their previous high. If stocks were in bubble territory back then, it's far less likely that they're in bubble territory today. 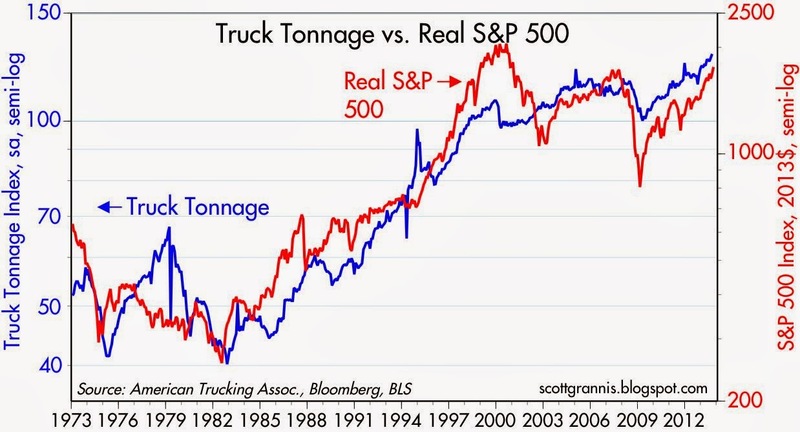 As Calculated Risk notes, the strong performance of the trucking industry owes much to the "robustness to the sectors of the economy that are growing fastest, like housing construction, auto production, and energy output. These industries produce heavier than average freight, which leads to faster growth in tonnage versus a load or shipment measure." The AAR indicated the amount of oil shipped by U.S. railroads for the year through the most recent week (ended October 24) increased 34.8 percent compared to 2012. As long as there is no Keystone Pipeline, Warren Buffett is more than happy to haul the oil by rail, as well as shipping in the fracking sand. Energy and materials stocks are firing on all cylinders. Even the coal stocks have rebounded. With the return of cheap, abundant energy, what will be the fate of windmills, electric/hybrid cars, and solar? Please consider The Dispensation Economics Manifest, ... http://theyenguy.wordpress.com/about/ ... which is based upon Ephesians 1:10, the biblical revelation that Jesus Christ, is operating in dispensation, that is the household management plan of God to complete and fulfill all things in every age, epoch, era and time period. The ANSAMed Anna Foundation report Italy's Debt Hits Record High Of 133.3% Of GDP In 2nd Quarter, indicates the true nature of Italy’s sovereign capability. Its level of Treasury Debt, suggests that it is an insolvent sovereign. Its seigniorage does not come from risk appraisal between bond buyers and sellers, but rather from the ECB’s monetary policies of LTRO 1 and 2, as well as OMT. And the only reason why it has fiscal capability is because of what amounts to seigniorage aid from the word, will and way of central banker Mario Draghi. Liberalism’s banker regime is being replaced by authoritarianism’s beast regime; and the only two forms of sovereign and sustainable wealth are diktat, and the physical possession of gold and silver bullion. Bad news is back to being Good news ... http://guggenheimpartners.com/perspectives/macroview/party-like-it%E2%80%99s-1999 ... good thing Polar-Bears can swim when conditions require it.